Ricardo Vaz Te's late strike fired West Ham back to the Barclays Premier League with a 2-1 victory over Blackpool in the npower Championship play-off final at Wembley. The Portuguese forward, a bargain £500,000 January signing from Barnsley, earned the Hammers an estimated £90million windfall with the goal which sank Blackpool. Boss Sam Allardyce vowed to take the club back to what he calls the Promised Land at the first attempt following last season's relegation, and he was as good as his word as his side saw off Ian Holloway's play-off specialists. Carlton Cole had given them the lead in the first half, but Thomas Ince showed he has inherited his dad Paul's uncanny knack of irritating West Ham's fans when he equalised just after the break. However, after an end-to-end second half it was Blackpool, who were unbeaten in their previous 11 play-off matches, who cracked as Vaz Te rifled in the winner four minutes from time. They may have been short-priced favourites having put eight goals past Blackpool in their league meetings this season, but West Ham looked extremely twitchy in the opening stages. After just three minutes Matt Taylor's attempt to chest the ball back to Robert Green fell short and Stephen Dobbie sneaked in behind the left-back. Fortunately for Taylor, the angle was tight and Dobbie's shot was kept out by a combination of Green and the near post. Matt Phillips then twice squandered glorious opportunities to put the Seasiders ahead. The winger latched onto a ball over the top only to shoot weakly at Green, and passed up an even better chance moments later when Guy Demel slipped, allowing him time to curl a shot narrowly wide. West Ham eventually settled into the game and a slick move between Cole, Gary O'Neil and Vaz Te ended with the latter hitting the side-netting. Cole then headed O'Neil's cross over before Jack Collison curled a shot just too high. And the goal West Ham had been threatening arrived in the 33rd minute when Taylor robbed Ince and charged down the left before sending a cross towards Cole. The striker took the ball in his stride, held off the challenge of Seasiders defender Ian Evatt and swept the ball past Matt Gilks and into the net. Vaz Te could have doubled the lead before half-time but he dragged his shot wide. 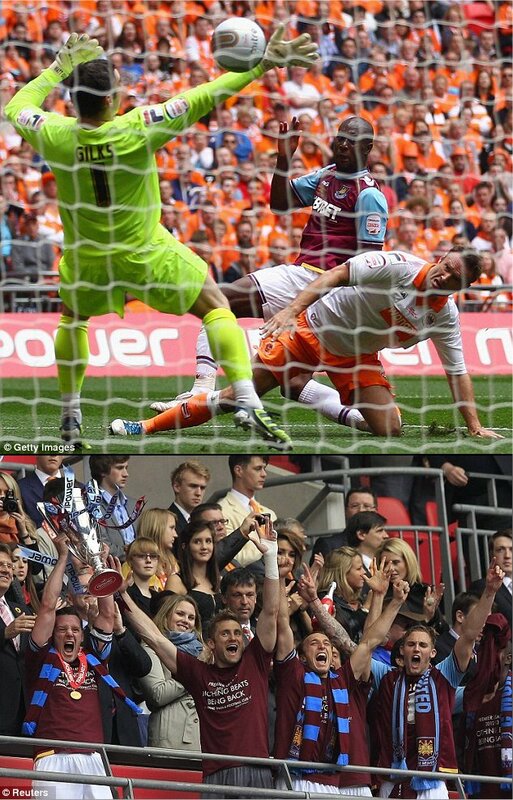 Instead, two minutes after the restart Blackpool hit the Hammers with a sucker-punch. Cole gave the ball away near the halfway line and Matt Phillips raced forward before swinging in a diagonal cross over the heads of the West Ham defence and right to the feet of Ince. The winger, whose every touch was jeered by the Hammers fans who never forgave Ince senior for the manner in which he left the club some 23 years ago, still had plenty to do. But he found a superb finish his dad would have been proud of, firing the ball across Green and inside the far post. With West Ham reeling, Blackpool almost went ahead moments later when Kevin Phillips played in Alex Baptiste, who dinked the ball over Green only for Taylor to clear the danger on the line. Back came West Ham and Collison poked Taylor's low cross wide before Gilks made a fine save low down to deny Cole, while at the other end Dobbie missed his kick in front of goal and also forced a fingertip save from Green. The Hammers were inches away from taking the lead again when substitute George McCartney overlapped down the left and crossed for Nolan, whose first-time volley was tipped onto the crossbar by Gilks. But the winner arrived four minutes from time in the most dramatic of fashion. Nolan crossed from the left and Cole's attempt was blocked by Gilks but the ball fell kindly for Vaz Te, who crashed it over the grounded Gilks and into the roof of the net. Blackpool Gilks, Eardley, Baptiste, Evatt, Crainey, Ferguson, Dobbie (Bednar 90), Angel (Dicko 90), Ince, Matt Phillips, Kevin Phillips (Sylvestre 71). Subs Not Used: Southern, Cathcart. West Ham Green, Demel (Faubert 57), Reid, Tomkins, Taylor, O'Neil (McCartney 53), Noble, Nolan, Collison, Cole, Vaz Te. Subs Not Used: Henderson, Maynard, Lansbury. Goals: Cole 35, Vaz Te 87.